There is a range of products available from Disaster Aid UK & Ireland. Below provides a description of each product and an indication of the cost of getting them to the scene of the disaster and into the care of a Disaster Aid Response Team. Actual costs vary according to the numbers supplied, the method of shipment, and whether or not import taxes and customs duties were incurred. Comprising a family sized high-sided tent to United Nations and SPHERE Standards, and the contents of a LifeBox. As many as 5,000 children a day die as a result of water borne diseases. Contaminated water is responsible for harbouring life threatening diseases such as cholera, typhoid, dysentery and bacteria. 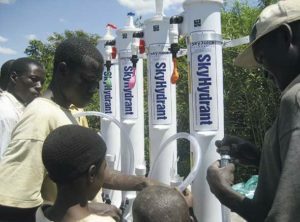 Disaster Aid International is proud to be partnering with the SkyJuice Foundation, an International not-for-profit organisation to provide a long term water solution in our suite of emergency relief products. Meets critical parameters as set out by the World Health Organisation – producing an average of 10,000 litres of filtered water per unit a day, we ensure survivors of disasters have access to clean water as they rebuild their lives. The tent is designed to shelter a family of 8 in separable “rooms”. It not only meets, but exceeds, standards set out by the United Nations and the Sphere Project for disaster relief products such as this. 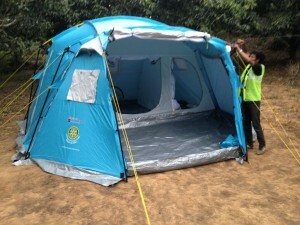 The tent is modular and can be connected with other tents of the same specification to provide a larger shelter system to house, eg a school or similar community co-operative. By taking advantage of the modular design of the Disaster Aid Tents a larger system can be created which could serve community needs (e.g. health station, school, information point). Some refugee camps exist for some time, and modular tents like this afford opportunities to form other community co-operatives too.